The College’s Department of Theatre and Dance and School of Music have long received regional and national acclaim for the talented performers they produce. Three young alumni—Jake Boyd, Katie Burton, and Krista Adams Santilli—through their work on both the stage and the screen are enhancing that reputation. 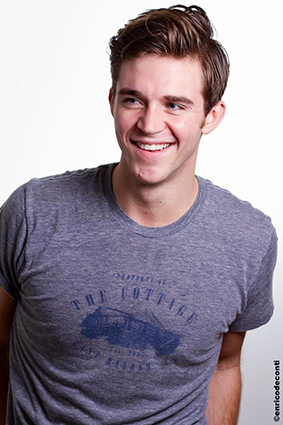 A Tuscaloosa native and 2010 graduate of the Department of Theatre and Dance, Jake Boyd has been featured in the off-Broadway production of Carrie and Oklahoma!, has played in a recurring role on TBS’s comedy Are We There Yet?, and most recently has worked with the Broadway musical Rock of Ages. A talented singer, Boyd always wanted to be a performer. A summer production of Hello Dolly with Theatre Tuscaloosa was the final push he needed to pursue acting. Even after he made his decision, Boyd faced some unexpected challenges in college. Under the tutelage of Associate Professor Seth Panitch and now-Professor Emeritus Ed Williams, both in the Department of Theatre and Dance, Boyd’s acting flourished. He received solid training, and was given the freedom to explore different aspects of each role and create unique characters. Some of his most memorable roles at UA include Jack in Into the Woods and Paul in Moon over Buffalo. Another formative experience for Boyd was performing in “Bama on Broadway,” the Department of Theatre and Dance’s musical theater showcase in New York. As part of the performance, musical theater students audition for professional agents and casting directors. As a result of that performance, Boyd landed a role in Carrie, which earned him membership in the Actors’ Equity Association. His current work as an understudy with Rock of Ages gives Boyd continuous employment, a rare situation for young actors. “It gives me the freedom to have an awesome job and do something that I love but also the ability to go out and audition for other things without conflict,” he said. With credits on the stage, including the 2012 production of The Last Smoker in America, and television, such as playing a young Jack Donagy on NBC’s 30 Rock, Boyd says he has developed flexibility in his craft. He credits the emphasis put on preparing for roles in college with helping him prepare for different opportunities. Looking forward, Boyd said he is still trying to find his place in New York. He hasn’t decided whether he will do more stage or screen acting, but he knows that he has come to the right place for the job he loves to do. You can follow Jake on Twitter @JaykeBoid. Katie Burton, also a 2010 graduate of the Department of Theatre and Dance, performed with Boyd in several UA productions including Into the Woods, where she played Cinderella. Because of her success in this role and her generally pleasant demeanor, Burton was often cast as “the sweet girl.” She challenged that persona by auditioning for the part of a “woman of disrepute” in UA’s production of The Wild Party. Burton, a Trussville native, used this experience to show a versatile range during UA’s “Bama on Broadway” showcase. The two-minute audition format prepared her for grueling professional auditions. Although the audition was intimidating, it allowed her to get her feet wet before making the big move to New York, she said. One of her first acting jobs after college was the result of work she did with Associate Professor Raphe Crystal, director of the College’s musical theatre program. Crystal was working on a musical version of William Shakespeare’s Loves Labour’s Lost with director Deloss Brown. Although Burton’s involvement in the show was small, it would later lead to more opportunities. Her “say yes” attitude has led to a variety of roles, including short films and television. Also, she has put her 10 years of competitive gymnastics training to good use in stunt work. Recently, she worked with the Upright Citizen’s Brigade, whose alumni include Amy Poehler of Saturday Night Live fame, doing improvisational comedy. Burton says she has really enjoyed finding her niche in comedy. Her dream job would be to land a steady role on a sitcom like Modern Family. Her most substantial stage role has been as Elisa in The Red and the Black, a world premiere off-Broadway production based on the 1830 novel of the same name written by Stendahl. She was called in to audition because of her previous work with the director, Deloss Brown. She said the best part of the experience was actually creating the show, since it was the first time it was being performed. Burton says her family and friends have been a huge support in her transition from Alabama to the hustle and bustle of New York. You can find more information about Katie Burton at www.katieaburton.com. 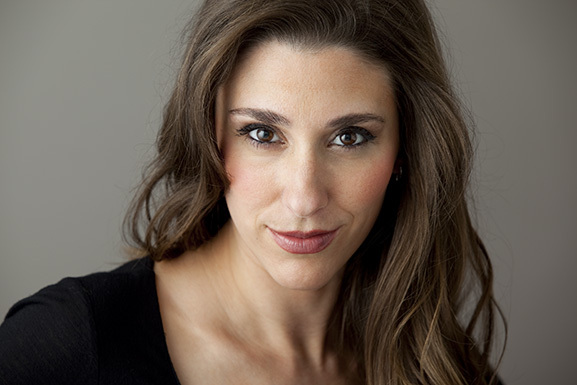 Burton costarred in The Red and the Black in New York with Krista Adams Santilli, a 2001 graduate of the College’s School of Music. For Santilli, whose background is in vocal performance and opera, the play was her first experience with a nonmusical play. For most of Santilli’s career, she has performed in musicals. She has appeared in The Pirates of Penzance with the Young Victorian Theatre Company; Rigoletto for Cheju-do Opera in South Korea; and Le Nozze di Figaro with Opera Birmingham. Santilli, a Birmingham native, remembers watching Annie and being inspired to become a performer. But it wasn’t until she was given a solo in her youth church choir that others became aware of her talent. She went on to participate in local summer theater programs including Birmingham Summerfest Musical Theater. Upon graduating from high school, Santilli was offered scholarships from The University of Alabama and the University of Montevallo. While both were appealing, Santilli chose UA because of its strong reputation as one of the best music programs in the state. Santilli’s voice blossomed as she studied under Dr. Susan Fleming, professor of voice and voice area coordinator in the School of Music. She was also given opportunities not available in other academic programs. A memorable role was as the Queen of the Night in Mozart’s The Magic Flute. Santilli said the relatively small size of UA’s School of Music allowed her to perform roles undergraduates usually do not get in larger programs. Following her graduation from UA, Santilli spent two years in Italy and Germany. Since returning to the United States, Santilli has performed at Carnegie Hall, the Kennedy Center, the Ronald Reagan Presidential Library, Sears Center Arena, Giants Stadium, and the U. S. military base at Fort Hood, among other places. Her early performances allowed her to develop a distinctive operatic sound. But when she was asked to tour with composer Eric Genuis in Australia, she branched out into contemporary and popular music. Genuis was known for writing Celine Dion–style ballads, a task that pushed Santilli out of her comfort zone. Since the tour, a new world of musical and theatrical opportunities has opened up. While music will always be her primary interest, Santilli says experiences such as acting in The Red and the Black have only expanded her prospects. Whether she is cast in television, film, or stage or whether she is asked to sing gospel, classical, or popular music, Santilli says she just wants to perform. Find Krista on the web at www.adams-santilli.com.